Awards for the “Saints” - ELLINIKI GNOMI • Die Zeitung der Griechen in Europa. The Saints celebrated a season, and a life, last night. 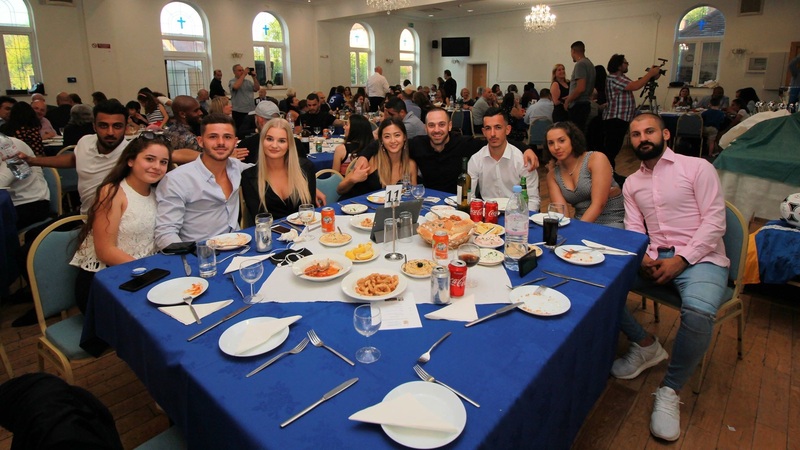 The Club hosted its annual Awards evening with a community dinner in memory of its co-founder and Treasurer, Pani Argyrou, who died recently in the young age of 29. At the end of each season, St Panteleimon hold an awards evening to honour their players and thank the supporters and volunteers, who make this club what it is. It is also a chance to raise funds for next season’s campaign. This year, we had the added special dimension of extra support from the 25 year old “Kick It Out” campaign, which aims to eradicate racism in football. The team organised huge banners #KickItOut25 to communicate this zero-tolerance message. As with everything this club does, actions speak louder than words: the Saints team has 7 different nationalities among its players. A testament to its openness. Around 130 people enjoyed an evening of hospitality, with the delicious food generously donated by Mr Savvas Andreou, the club’s president. The formalities then commenced with the club Chaplain Father Anastasios Salapatas, giving a moving speech about the role the club plays in the community, and the fact that other communities are approaching ours for tips and guidance in their own development. Then the club manager, George Frangeskou, introduced the awards section with a very powerful video he made, showcasing the achievements of the Invincibles last season, winning the Division One championship of the Middlesex County Football League unbeaten. There was also a tribute to Pani that left everyone cheering and clapping at the end. The awards were presented by invited dignitaries and honoured guests, such as Mr Panicos Herodotou, community great benefactor, Mr Pantelis Demosthenous, journalists Mikkos Chrysostomou, of Eleftheria, and Michael Yiacoumi, of the Parikiaki newspaper, and our new community and church board president, Dr Panayiotis Procopiou. The Director of Football, John Armenakas and the Manager, George Frangeskou, were also honoured with gifts from the club committee, for an unforgettable season, as was the president, Savvas Andreou, for his generous catering. There was a raffle held to raise funds for the club. The Club Treasurer, Iacovos Neophytou ran this with Alice Bekiari, a teacher from the St. Panteleimon Hellenic College. All prizes were claimed on the evening, apart from one picture print from a Cypriot artist, which was then auctioned. The winning bid belonged to Gina Frangeskou, after some interesting bidding against professional footballer Panos Armenakas, of Udinese. As part of the prizes, three community restaurants kindly donated complimentary meals for four: PanOrama in Whetstone (gift of Maria Argyrou), Baraccuda in Harrow (gift of Yiannis Christofis) and Sea Pebbles in Pinner (gift of Savvas Andreou). The community gave great feedback to the committee, and great fun was had by all.